Famous for its stunning scenery, Scotland is also home to some of the world’s most glorious and diverse gardens. With its varied terrain and extremes of climate the range of its garden styles is boundless, but perhaps the greatest glory is the flowers. Whether in vast walled enclosures or smaller domestic enclaves, Scotland’s floral brilliance is spectacular. With the aid of her authoritative text you can locate a Judas tree, a handkerchief tree and a New Zealand cabbage tree. You can sniff ‘the languid odour of lilies’ and stroll among snake’s head fritillaries, along an avenue of monkey puzzle trees or through a fernery. You can explore a mushroom house, heated melon pit or faery hut and inspect a cryptogram sanctuary or the oldest vine in Scotland. For through the ages a diverse cast of earls, slave traders, sugar magnates, distillers, publishers, vets, lawyers, joiners and architects have left their imprint on their Scottish gardens. Whether walking the landscape or curled up in front of a warm fire, you will discover the stories of the great Scottish plant-hunters, kaleyards, doocots, the burry man, curling and ice houses and read about the castles and houses around which the gardens developed. 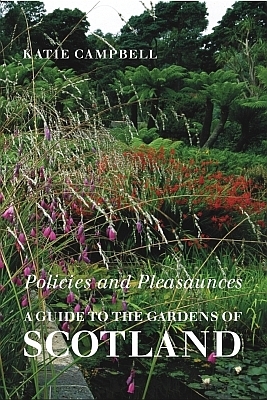 Policies and Pleasaunces is a wonderfully informative and fascinating guide for anyone exploring Scotland’s heritage. Whether you are a casual tourist, dedicated gardener or garden historian, Katie Campbell’s vivid descriptions, her understanding of the rich historical and social background to the gardens and her inclusion of the practical details make this an essential touring companion. Katie Campbell is a fiction writer and garden historian. She has written plays for stage and radio, as well as a novel and several collections of poetry and short stories. In recent years she has become fascinated by garden history and now lectures on the postgraduate garden history course at Bristol University. Her first book on the subject, Icons of Twentieth-Century Landscape Design, has been widely acclaimed.